conical protrusion of the central part of the cornea, resulting in an irregular astigmatism. A conic protrusion of the cornea caused by thinning of the stroma; usually bilateral. See also: Fleischer ring, Munson sign. 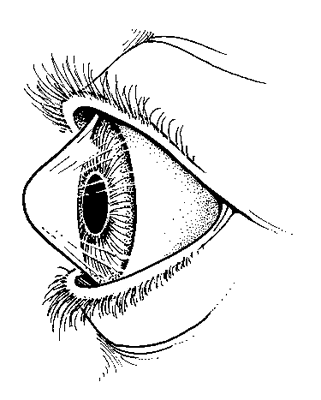 /ker·a·to·co·nus/ (-ko´nus) conical protrusion of the central part of the cornea. a noninflammatory protrusion of the central or paracentral region of the cornea. It is worse in allergy sufferers and may result in marked irregular astigmatism. It is also associated with Down syndrome. Gas permeable contact lenses often significantly improve visual acuity as compared with spectacles, although a corneal transplant is indicated in about 15% of patients with this condition. The cause of the condition is unknown, but it likely has a genetic basis. A growth disorder (dystrophy) of the CORNEA causing central peaking or conicity and affecting vision. The main disability is from image distortion. Keratoconus is a familial condition that usually starts in adolescence, affecting girls more than boys. Spectacles may help at first, the progressive distortion usually calls for correction with hard contact lenses. Corneal grafting is often eventually required but the results are usually good. An eye condition in which the cornea bulges outward, interfering with normal vision. Usually both eyes are affected. 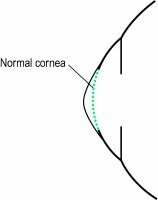 A developmental anomaly in which the central portion of the cornea becomes thinner and bulges forward in a cone-shaped fashion. Two types of cones are commonly described: a round cone and an oval (or sagging) cone. It usually appears around puberty, is bilateral, although one eye may be involved long before the other. Other corneal signs may be Vogt's striae, Fleischer's ring, scarring and corneal hydrops, as well as myopia and irregular astigmatism. The condition may be associated with osteogenesis imperfecta, ectopia lentis, aniridia, retinitis pigmentosa, Down's syndrome, Ehlers-Danlos syndrome, Marfan's syndrome. The main symptom is a loss of visual acuity due to irregular astigmatism and myopia. Correction is usually best achieved with contact lenses, especially rigid gas permeable, but if these cannot be worn or the condition is very severe, a corneal transplant is carried out (Fig. K1). Syn. conical cornea. See central corneal clouding; pellucid marginal degeneration; corneal ectasia; acute hydrops; keratoscope; combination lens; piggyback lens; lenticonus; blue sclera; Munson's sign; Rizzuti's sign; stria; corneal topography. conical protrusion of the central part of the cornea.